Mülheim, November 7, 2018 – At the SPS IPC Drives fair, Turck will be presenting some powerful devices with Codesys 3 programming as additions to its TX HMI/PLC series. Compared to the established TX500 models, two central modifications have been added: The TX700 devices operate with multicore processors at an operating frequency of 800 MHz and use a modern Linux platform. This makes it possible to implement more complex control tasks and visualizations. The glass display of the TX700 units with a capacitive touch function enables intuitive operation with the gesture control typically used with smartphones. With their range of interfaces, the TX700 units offer versatile use straight from the factory, such as master operation in Profinet, Ethernet/IP, Modbus TCP, Modbus RTU and CANopen. Use as a slave (server) is also possible in both Modbus networks. This versatility considerably reduces the number of device variants that have to be kept in stock. CANopen and Modbus RTU are particularly useful for retrofits and for connecting existing machine parts easily to modern controller systems. An integrated OPC UA server allows the parallel transfer of monitoring data to higher-level systems. Thanks to the three separate Ethernet ports provided, users can physically separate communication to cloud or office IT networks from the machine controller. This guarantees reliable PLC operation and enables switch functions to be implemented for creating line topologies. A Sub-D connector, an SD card slot as well as two USB ports complete the range of physical interfaces. The TX700 devices are available in display sizes of 5, 7, 10, 15 and 21 inches. 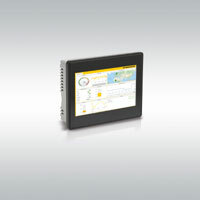 Turck's TX100 Series also offers simple HMI operating devices without any PLC functionality.